The Girl Scouts have held dominance over the seasonal cookie market for years. For almost a century, these cookies have held greater anticipation than any other holiday-themed cookie, whether Christmas, Easter, Valentine’s Day, or Halloween. The Girl Scouts are more known for their cookies than anything else they do. What else do they do? 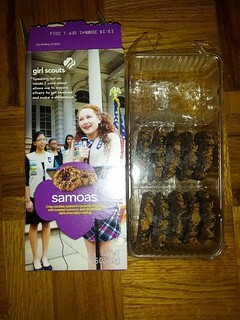 I doubt people actually thought the Girl Scouts baked the cookies themselves, the job is outsourced to large bakery corporations under license. One of these licenses is under the Keebler umbrella. I don’t know why no other companies were successful in copying the Girl Scout cookie formulas, perhaps there were patent/copyright laws that recently expired. No matter, Keebler is now directly competing with one of their own clients. 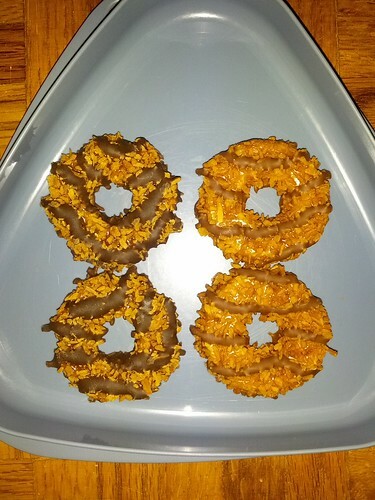 My Girl Scout cookie of choice is the Samoa, which consists of a ring-shaped cookie covered with caramel, toasted coconut, and stripes of dark chocolate. 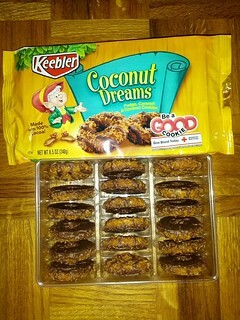 On a recent trip to Target, I saw Keebler’s Coconut Dreams on the shelf. They are nearly identical, substituting fudge stripes instead of dark chocolate. 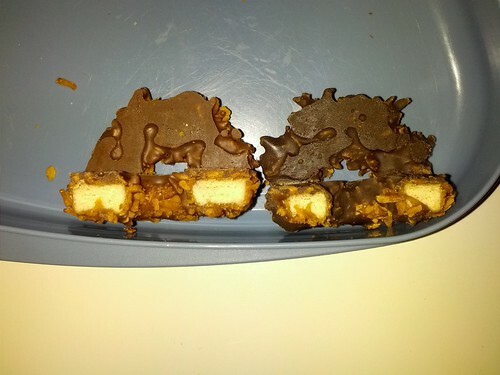 Close-up of the cookie obverse side by side – Girl Scout Samoas on the left, Keebler Coconut Dreams on the right. While the Keebler cookies are cheaper and more calorie-friendly per unit, it’s all meaningless if they don’t pass a taste test. I am pleased to announce that both cookies not only taste nearly the same, but they also have a similar mouth-feel. Results: Keebler version is cheaper and fewer calories per cookie; Girl Scouts have history and you would be supporting your local organization. Conclusion: Buy both and enjoy. Since I’m cheap, I’m happy with the Keebler. If you were wondering, Keebler also has other versions of the Girl Scout favorites. 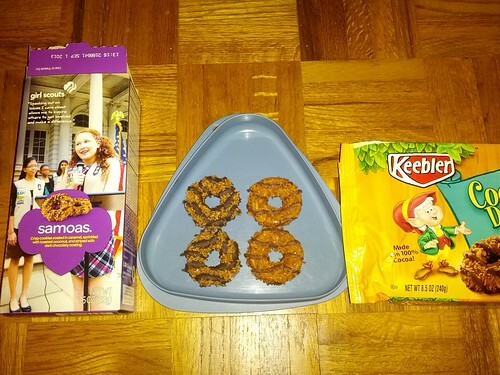 This entry was posted in Food and tagged Coconut, cookie, Dreams, Girl Scout, Keebler, Samoas. Bookmark the permalink.